Erosion strikes fear into the hearts of the 2.5 billion people globally who depend on agriculture for their livelihoods. Eroded land leads to declines in soil quality and agricultural productivity, as well as more frequent and severe landslides and flooding. These same farmers, though, are often unaware that they can be the cause of erosion. People often clear trees, shrubs and other vegetation to make way for plantations, grazing land and farms. But degraded and deforested land often leads to severe erosion. Regreening landscapes by planting trees and resilient crops secures soil in place, preventing erosion and mitigating the impact of natural disasters. 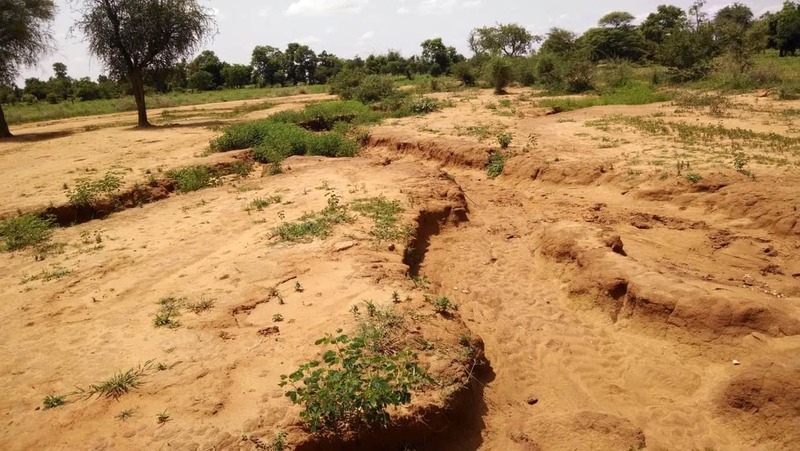 In southwestern Burkina Faso, decades of woodcutting, rising temperatures and pressure on the land from population growth have led to drastic changes in precipitation patterns. Cutting down trees removes the root systems that hold soil in place during severe rains. Deforestation’s impact has become even more severe in recent years, as less rain comes in short, intense downpours that wash away topsoil. The resulting erosion has left the land nearly untillable and has accelerated desertification. Deep scars, created by the removal of loose soil by rain, crisscross the landscape and are expanding, endangering the livelihoods of small farmers by making cultivation and grazing impossible. Recognizing this restoration opportunity, the German development agency GIZ partnered with Burkina Faso’s Ministry of Agriculture and local communities to launch a six-year project. Since 2013, local farmers and municipalities have installed erosion-control measures like compost bins and rainwater storage containers, planted more than 170,000 trees and crops, and protected and restored more than 18,000 hectares (45,000 acres) of watersheds. This restoration is also critical for the Great Green Wall initiative, which aims to create an 8,000-kilometer belt of green space across 20 countries to prevent desertification, increase food security and fight climate change. Deforestation in Nepal has accelerated in the past few decades, exacerbated by violent insurgencies that have pushed more people into poverty. Desperate for wood for cooking fires and building material for new homes after displacement, struggling Nepalis denuded the landscape. The demand for timber from Indian lumber companies has also increased pressure on forests. The result is that Nepal has lost at least 42,597 hectares of forest since 2000. In a mountainous country susceptible to landslides, every tree lost creates erosion, threating farms and villages downslope. The degraded landscape amplified effects of the 2015 earthquake, which killed more than 9,000 people and caused massive landslides that destroyed already-limited arable land. In southern Nepal, the annual monsoon washes away villages and clogs dams with sediment, endangering rural communities. In areas where local communities have implemented restoration projects, however, flooding is less severe, soil is held in place, and rivers run clean, even during heavy monsoons. Local farmers have helped restore landscapes and prevent erosion by planting bamboo on degraded mountainsides and terracing the land. This history of success shows promise for the 24 percent of Nepal that is both ready for restoration and suffers from severe erosion. Restoration’s effectiveness in preventing erosion is especially clear in Nepal’s Phewa Lake region. In the 1970s, deforestation devastated the area, with eroding mountains turning the lake into a brown, tepid pool. Communities throughout the Phewa watershed banded together to plant trees and terrace land, supported by the government. Their work created a safer environment for Phewa’s residents as well as a vibrant regional economy that welcomes 500,000 visitors per year. After last year’s landmark peace accord, deforestation skyrocketed in Colombia as thousands of displaced people returned home to lands previously controlled by rebel groups. They began to clear land for agriculture and herding, leading to 425,000 hectares (1 million acres) of tree cover loss in 2017 alone, adding to the thousands of hectares already deforested for coca production. This recent deforestation will surely increase the risk of erosion—even before 2017, 40 percent of the nation was threatened. In 2011, land degradation in Colombia’s mountainous northwest caused severe landslides and flooding that killed 1,374 people and destroyed 100,000 homes. Colombia has recognized the challenge it faces, represented by its 2014 Bonn Challenge pledge to restore 1 million hectares (2.5 million acres) of degraded land. Colombia will implement its pledge through Initiative 20×20, which aims to begin restoring 20 million hectares (49 million acres) of degraded land in Latin America and the Caribbean by 2020. Part of the restoration solution is reforestation, but a $314 million opportunity lies in the expansion of agroforestry and silvopasture, where agriculture and herding exist simultaneously with trees. Incentivizing agroforestry and silvopasture on the 14 percent of Colombia’s land that is eroded and ripe for restoration could prevent deadly mudslides, stop sedimentation and increase agricultural yields. To find erosion risk and restoration opportunities in your area of the world, check out the data layers on Resource Watch.